Cool roof system for buildings is a roofing system that can deliver high reflectance (the ability to the visible, infrared and ultraviolet wavelength of the sun, reducing heat to the building) and high thermal emittance (the ability to release a large percentage of absorbed, or non-reflected, solar energy) is a cool roof. Cool roof can be used as a geo-engineering technique to tackle global warming based on the principle of solar radiation management, provided that the materials used not only reflect solar energy, but also emit infra-red radiation to cool the planet. Increased cooling energy use and higher utility bills. Higher peak electricity demand (the maximum energy load, in megawatts, an electric utility afternoons as business and residences turn up their air conditioners), raised electricity production costs, and a potentially overburdened power grid. Increased air pollution due to the intensification of the “Heat island effect”. Accelerated deterioration of roofing materials, increased roof maintenance costs, and high levels of roofing waste send to landfills. Reduced building heat gain, as a white reflective roof typically increases only 10-25 degrees F above ambient temperature during the day. Create savings on summertime air conditioning expenditures. Improve thermal efficiency of the insulation; this is because as temperature increases, the thermal conductivity of the roof’s insulation also increases. Reduced the demand for electric power by as much as 10 percent. Reduce resulting air pollution and green house gas emission. Provide energy savings, even in northern cli8mates. 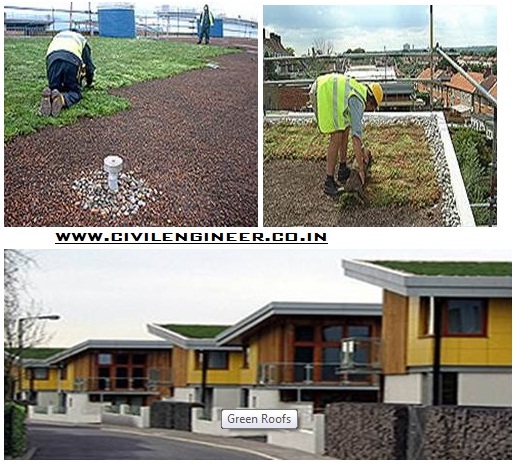 The term Green roof is used to indicate Roof that utilize some form of Green technology. Green roof is roof of a building that is partially or completely covered with vegetation andsoil, or a growing medium, planted over waterproofing membrane. Rooftop ponds are another form of Green roof which are used to treat gray water. It also used to indicate roof that utilizes some form of Green Technology such as Solar panels or a Photovoltaic Module. A Green Roof consists of a drainage layer and a waterproof membrane typically covered in a thin layer of 2-4 inches of soil compacted with low growing plants. Local weather conditions, temperature, and structural factors should determine the appropriate types of plants that are used. Common plant species include sedum, alpines, delosperma, succulents, and a wide variety of grasses and mosses. Significantly reduce the heat island effect. Capture pollution particles, break them down and reabsorb them as fertilizer and respirate oxygen back into the air. Allow for the absorption of storm water (up to 90% of an areas rainfall), and reduce pollution runoff. Reduce surface temperature of the membrane up to 40% on hot afternoons.